Our BE-705D Door Intercom Station with Card Reader & Key Fob allows controlled entry access to its users. The BE-705D is well contained in a brushed aluminum shell and is vandal proof to avoid tampering. Weighing less than one pound, the 3.75 inch wide by 6.8 inch tall BE-705D Door Intercom Station can be surface or flush mounted for easy access. Its IR LED color camera includes night vision for 24 hour security. The BE-705D requires a four conductor cable connection for full functionality. 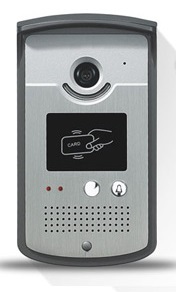 The Door Intercom Station allows entry door release features and card reader / key fob access. Apartments, condominiums, business offices, parking garages, schools & colleges, and assisted living facilities are only a few venues that benefit from our BE-705D Door Intercom Station with Card Reader & Key Fob. Contact us for more information regarding the BE-705D.